Total and Pavilion Energy today said they have taken the next steps as part of their planned agreement to jointly develop a Liquefied Natural Gas (LNG) bunker supply chain in the port of Singapore. After signing a Memorandum of Understanding (MoU) last year, the companies have now signed a Heads of Agreement (HoA) covering the shared long-term time charter of an LNG bunker vessel as well as an LNG supply arrangement between the two companies enabling Total to deliver LNG bunker to its customers. Patrick Pouyanné, Chairman and CEO of Total, declared, "The development of infrastructure is one of the key drivers for the take-off of LNG as a marine fuel. For the past few months, Total has been very active in that direction. The agreement signed with Pavilion Energy marks a new step in our commitment to provide our customers with fuels that are more environmentally friendly, particularly in Singapore which is the leading bunkering hub in the world." 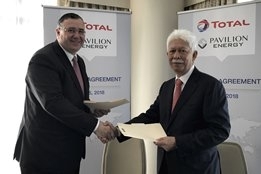 Tan Sri Mohd Hassan Marican, Chairman of Pavilion Energy, said, "Pavilion Energy is pleased to work with Total on establishing a robust LNG bunker supply chain in Singapore. Our partnership sets the stage for making LNG bunker readily and reliably available for the market. Together, we mark a decisive step forward in leading the change towards cleaner and more responsible solutions with LNG bunkering in the region."